Thanks to Wild Idaho Rising Tide (WIRT) activists, allies, and friends for your patience during a November that opened opportunities for a long-overdue, month-long, event-free break, especially from the rigors of side-job wage slavery. With more time and energy for activism emerging from this healing phase, we plan to soon re-establish a regular WIRT email newsletter and to post WIRT radio program recordings, both drawn from our active facebook page. Please support ongoing WIRT and allied mobilization of regional residents for coordinated, region-wide actions and agency hearings and comment periods, confronting Northwest coal, oil, gas, and tar sands facility and transportation projects. Look for upcoming announcements throughout autumn and winter 2016-17 about participatory events including educational presentations, direct action training workshops, peaceful protests, and benefit concerts that advance our shared anti-fossil fuel/climate change campaigns. During this last opportunity for public input on Millennium Bulk Terminals, please comment on the U.S. Army Corps of Engineers (Corps) draft environmental impact statement (EIS) and a dredging permit application for the Longview, Washington coal export facility proposed by Lighthouse Resources [1-3]. Before the public comment period ends on Tuesday, November 29, urge the Corps to oppose construction and operation of the largest coal export terminal in North America, and to protect public health and natural resources, by supporting the “no action” alternative of the draft EIS and rejecting the permit application. Millennium’s eight additional, fully loaded, unit coal trains per day and the coal transfer and storage site, annually handling up to 44 million metric tons of coal, would harm the health and safety, air and water quality, and natural resources of communities throughout the Northwest. As the draft EIS describes, Millennium would receive coal via trains from western U.S. mines and transfer it to Asia-bound, ocean-going vessels, at the 190-acre, leased site of the former Reynolds Aluminum smelter. Its facilities would include an operating rail track and unloading station, a coal stockpile area and eight-track rail loop for storage, a conveyor and two independent ship loaders, and two new docks to berth Panamax-class vessels. Because Lighthouse Resources seeks to dredge up to 48 acres out to the Columbia River navigation channel, the company has applied for a permit under Section 404 of the Clean Water Act and Section 10 of the Rivers and Harbors Act. Between April 29 and June 13, 2016, most of the 250,000 commenters on a separate Millennium draft EIS, issued by the Washington Department of Ecology and Cowlitz County, opposed this coal export facility . But the Corps granted the proposal a favorable review in its federal draft EIS released on September 30. In its 3,000-plus-page document, the agency described potential project damages to air, water, fish, wildlife, and communities, including more train traffic congestion, elevated railroad noise levels, and increased wait times at rail crossings, especially in low-income and minority communities. The Corps held only two public hearings on its draft EIS, on October 24 in Longview, Washington, and on October 25 in Ridgefield, Washington, “to provide the public an opportunity to share its views and opinions” on this last of six proposed coal export terminals in Oregon and Washington [5, 6]. It did not offer hearings beyond the Longview/Vancouver/Portland area for citizens of Montana, Idaho, and eastern Washington, and no one coordinated testifier buses from these areas to the southwest Washington hearings. An increase in coal trains across the Idaho panhandle would not only pollute our waters, lands, and bodies with coal dust and diesel fumes, it could also take human and non-human lives. According to the Federal Railroad Administration, Idahoans experienced 21 accidents between vehicles and trains at public and private rail crossings of all railroads in the state between August 2015 and July 2016. 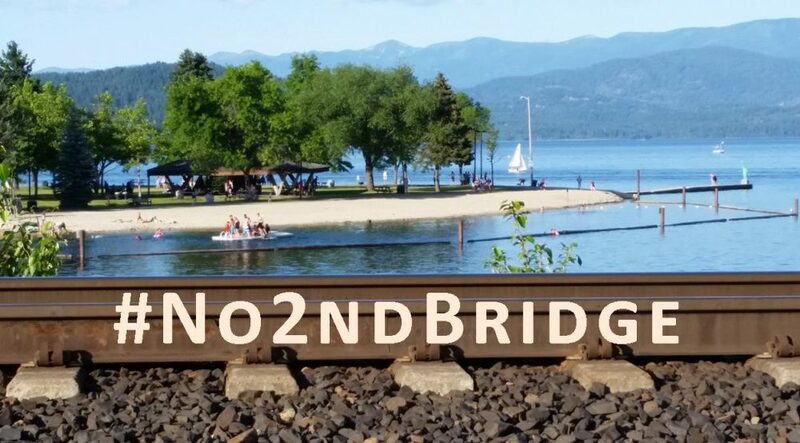 In the northernmost Idaho counties, four incidents without injuries or deaths occurred at one private and three public crossings in Boundary and Kootenai counties. Two people died at private and public crossings in Bonner County during the last year-plus. Please join us in working together to stop Millennium Bulk Terminals, by convincing the U.S. Army Corps of Engineers to NOT approve project dredging, construction, and operation. Send your comments on the Corps draft EIS to http://www.millenniumbulkeiswa.gov/submit-comments.html, and your remarks on the dredging permit application, referencing NWS-2010-1225, by e-mail to NWS.MBTL@usace.army.mil. The Corps will review and consider all comments offered during the public input period. Please attend a forum emceed by Laura Ackerman of The Lands Council, to together learn about, envision, and share the current revolution that is winning a just and equitable shift to a clean energy economy . Speakers include KC Golden of Climate Solutions, Evita Krislock of the Episcopal Diocese of Spokane, and Gavin Tenold of Pura Vida High Performance Builders. The Lands Council, Climate Solutions, and Gonzaga Environmental Law and Land Use Clinic are co-sponsoring this event, and WIRT and a dozen other Washington and Idaho groups are co-hosting it. Join us at 7 pm on Wednesday, November 30, in the Gonzaga Moot Law Court at the Gonzaga University School of Law, 721 North Cincinnati Street in Spokane, Washington. 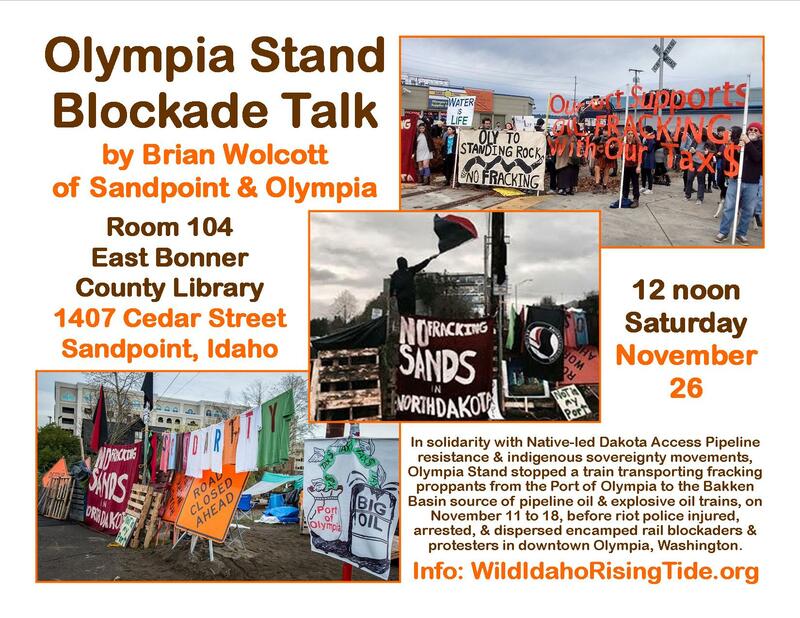 Please join Wild Idaho Rising Tide (WIRT) and allies at 12 noon on Saturday, November 26, in Room 104 of the East Bonner County Library, 1407 Cedar Street in Sandpoint, Idaho, for a public presentation offered by Brian Wolcott, an Evergreen College student, Olympia Stand activist, and Sandpoint resident. With photos, videos, and descriptions, Brian will talk about the week-long Olympia Stand blockade of a train transporting Chinese fracking proppants from the Port of Olympia to the Bakken shale oil and gas fields in North Dakota, the source of leaky pipeline oil and explosive oil trains. Between November 11 and 18, community demonstrations and an encampment on the tracks expressed solidarity with Native-led Dakota Access Pipeline resistance at the Standing Rock Reservation in North Dakota and with indigenous sovereignty movements defending the water, fishing, and hunting rights of local tribes, before riot police injured, arrested, and dispersed blockaders and protesters in downtown Olympia, Washington. For further event information, Olympia Stand media releases, regional and national news coverage of the blockade, and a donation site for arrestees’ legal funds, see the Olympia Stand public facebook group and the event announcement on the WIRT website [1, 2]. Although WIRT did not hold our usual, third Wednesday, monthly gathering in Sandpoint this November, we invite WIRT activists, allies, friends, and contacts to connect and start collaboration with an Olympia comrade during the Thanksgiving break. Converge at 10:30 am for a private, closed-door, WIRT planning meeting, before Brian’s greatly appreciated noon presentation, in Room 104 of the East Bonner County Library. Brian grew up in Sandpoint, and intends to return to the Coeur d’Alene area to organize resistance efforts, when he concludes his Evergreen education. During his weekend visit with his family and hometown, he hopes to share and discuss with old friends and the Sandpoint activist community ideas and decisions about coal, oil, and fracking sand train protesting and monitoring, the role that police play in demonstrations, and any other helpful information. The Wednesday, November 23, 2016 Climate Justice Forum radio program hosted by regional climate activist collective Wild Idaho Rising Tide (WIRT) features an interview with Bellingham-based, core WIRT activist Herb Goodwin about his participation and arrest at Dakota Access pipeline resistance camps and actions. We also share news about Idaho Transportation Board-approved rules for Highway 12 megaloads, the week-long blockade of a Bakken fracking sand train from the Port of Olympia, Missouri River tunnel drilling and police brutality along the Dakota Access pipeline route, and upcoming, inland Northwest presentations, forums, and solidarity actions. Broadcast on progressive, volunteer, community station KRFP Radio Free Moscow every Wednesday between 1:30 and 3 pm PST, live at 90.3 FM and online, the show covers continent-wide fossil fuel resistance and community opposition to extreme energy projects, thanks to the generous, anonymous listener who adopted program host Helen Yost as her KRFP DJ. The Wednesday, November 9, 2016 Climate Justice Forum radio program hosted by regional climate activist collective Wild Idaho Rising Tide features news about the closure or abandonment of two Alberta tar sands extraction operations built by Northwest megaloads, the last opportunities for public input on a Grays Harbor oil-by-rail terminal, a federal court trial of Burlington Northern Santa Fe Railway polluting Northwest waterways with coal dust and particles, and upcoming solidarity actions demanding a halt of Dakota Access pipeline construction under the Missouri River near the Standing Rock Reservation. Broadcast on progressive, volunteer, community station KRFP Radio Free Moscow every Wednesday between 1:30 and 3 pm PST, live at 90.3 FM and online, the show covers continent-wide fossil fuel resistance and community opposition to extreme energy projects, thanks to the generous, anonymous listener who adopted program host Helen Yost as her KRFP DJ. The Wednesday, November 2, 2016 Climate Justice Forum radio program hosted by regional climate activist collective Wild Idaho Rising Tide features updates on the last opportunities for public input on Northwest coal and oil terminal proposals, a federal court ruling that coal dust and particles pollute Northwest waterways, militarized assaults and arrests of Standing Rock Lakota and allied water protectors in the path of Dakota Access pipeline construction, and other regional fossil fuel resistance topics. Broadcast on progressive, volunteer, community station KRFP Radio Free Moscow every Wednesday between 1:30 and 3 pm PDT, live at 90.3 FM and online, the show covers continent-wide climate activism and community opposition to extreme energy projects, thanks to the generous, anonymous listener who adopted program host Helen Yost as her KRFP DJ.